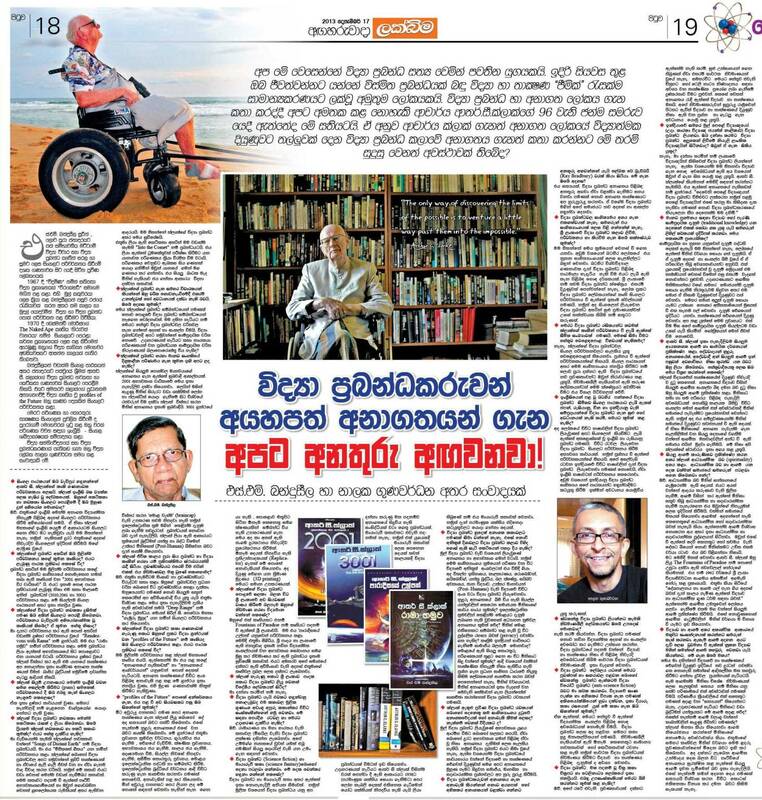 Lakbima Sinhala daily newspaper has just published my long interview with S M Banduseela who is widely recognised as Sri Lanka’s foremost translator of science and science fiction. He is best known as Arthur C Clarke’s Lankan translator. Those segments are not repeated here. Lakbima has also carried my questions related to Clarke’s views on traditional knowledge, and on religion. Banduseela answers them in his capacity as a leading rationalist and free thinker in Sri Lanka. Note: Sir Arthur Clarke (1917-2008) was a life-long non-believer: he was against all forms of organised religion (no exceptions! ), and considered religions to be the worst form of ‘mind virus‘. See also: Arthur C Clarke’s last story: A world without religion in 2500 A.D.
මානව ප්‍රගමනය සඳහා විද්‍යාව හෝ පැරණි සම්ප්‍රදායික දැනුම (traditional knowledge) යන දෙකෙන් එකක් තෝරා ගත යුතු යයි සමහරුන් ලිහිල් තර්කයක් ඉදිරිපත් කරනවා. මෙය කොතරම් ප්‍රායෝගික ද? සම්ප්‍රදායික හා නූතන යනුවෙන් දැනුම් පද්ධති දෙකක් ඇතැයි මම හිතන්නේ නැහැ. ලෝකයේ ඇත්තේ මිනිස් වර්ගයා සොයා ගත් දැනුමයි. ඒ ඒ දැනුම්, අදහස් හා සංකල්ප බිහි වූයේ ඒ ඒ පරිසරවල තිබු අවශ්‍යතාවන්ට අනුවයි. එක් යුගයකදී ප්‍රයෝජනවත් වූ දැනුම් සමුදායක් එම තත්වයන් වෙනස්වී මෙන් පසු එතරම් වැදගත් නොවන්නට පුළුවනි. උදාහරණයකට ආගමික මතිමතාන්තර වගේ. සමහර සමාජයන්හි දැනුම සොයා ගැනීම නිරතුරුවම සිදුවන අතර එම සමාජ ඒ නිසාම දියුණුවෙන් දියුණුවට පත් වෙනවා. සමහර සමාජ අලුත් දැනුම සොයා යෑමට උත්සාහ නොකර අතීතකාමයෙන් මුසපත් වී එක තැන ම පල් වෙනවා. දැනුම වේගයෙන් ඉදිරියට යනවා. තාක්ෂණයත් වේගයෙන් දියුණු වෙනවා. අප කළ යුත්තේ මෙම ප්‍රවාහයට එක් වීම මිස අපේ සම්ප්‍රදායික දැනුම සියල්ලට ම වඩා උසස් යයි කියමින් ගෝත්‍රිකයන් මෙන් ජීවත් වීම නොවෙයි. ආතර් සී ක්ලාක් ඉතා පැහැදිලිව ම සියලු ම ආයතනගත ආගම් හා සාමයික දර්ශනයන් ප්‍රතික්ෂේප කළා. දේවවාදයන් නුදුරු අනාගතයේත්, අදේවවාදී අන් සියලු ම ආගම් ඉන් පසුවත් අවභාවිතය නිසා තුරන්ව යන බවට ඔහු ලියා තිබෙනවා. හේතුවාදියෙකු ලෙස ඔබ මෙය විග්‍රහ කරන්නේ කෙසේ ද? ක්ලාක් විද්‍යාවේත් තාක්ෂණයේත් දියුණුව නිවැරදිව දුටු කෙනෙක්. අනාගතයේ විද්‍යාව විසින් සියලුම ආගමික සංකල්ප බිඳ දමන බව දුටු නිසා ඔහු සියලුම ආගම් ප්‍රතික්ෂේප කළා. මිනිසාට තමා හා තම පරිසරය පිළිබඳ පැහැදිලි අවබෝධයක් නොතිබූ කාලයක බිහි වූ විවිධ සංකල්ප මෙන් ආගමත් එක් අවස්ථාවකදී මිනිස් සමාජයේ පැවැත්මට ප්‍රයෝජනවත් වෙන්නට ඇති. නමුත් අද එය සම්පූර්ණයෙන් ම මිනිස් සමාජයේ දියුණුවට තර්ජනයක් වී ඇති දෙයක්. ඒ නිසා මිනිසාගේ අනාගත පැවැත්ම ගැන සැලකිලිමත් වන සියලු දෙනාගේ වගකීම වන්නේ ආගමික මතවාද වලින් අන්ධ වී ඇති සමාජය එයින් මුදවා ගැනීමයි. මේ නිසා අපි ක්ලාක්ගේ ස්ථාවරය ඉතා අගය කළ යුතුයි. සියලු ආගම් කාරුණිකව ප්‍රතික්ෂේප කරන අතර ක්ලාක් අධ්‍යාත්මික බව (spirituality) අගය කළා. අධ්‍යාත්මික බව හා ආගම් යන දෙක වත්මන් සමාජයේ සමහරුන් පටලවා ගෙන තිබෙනවා නේද? ඔව්. අධ්‍යාත්මිකබව මිනිස් සන්තානයේ ගැඹුරෙන් ම ඇති දෙයක්. එයට අයත් වන්නේ ආදරය කරුණාව වැනි මුලික හැඟීම්. ආගම් විසින් කර ඇත්තේ මිනිසා සතුව තිබූ අධ්‍යාත්මික හා සදාචාරාත්මක හැඟීම් පැහැරගෙන එය ඔවුන්ගේ නිපයුමක් ලෙස ඉදිරිපත් කිරීමයි. වත්මන් සමාජයේ මතයක් තියෙනවා ආගමක් අදහන්නේ නැති කෙනෙකුගේ අධ්‍යාත්මික හෝ සදාචාරාත්මක බවක් නැතැයි කියා. ඇත්තෙන් ම ආගම් විශ්වාස නොකරන අය අතර ඉතා අධ්‍යාත්මික හා සදාචාරත්මක පුද්ගලයන් සිටිනවා. ඔවුන් එසේ වී ඇත්තේ දෙවි කෙනෙකුට හෝ කර්මය වැනි දේකට බියෙන් නොව මිනිස්කමට උචිත එක ම චර්යා රටාව එය බව පිළිගන්නා නිසයි. ඇත්තෙන් ම ආගමික උමතුවෙන් ලෝකය ගලවා ගැනීමේ එක ම මග වන්නේ සියලුම ආගම් ප්‍රතික්ෂේප කිරීමයි. එසේ නොවුන හොත් ආගමික ගැටුම්වලින් මිනිස් වර්ගයා ම විනාශ වී යෑමට ඉඩ තියෙනවා. විද්‍යාව හා ආගම් අතර අතාත්වික ආකාරයේ මතුපිට සංසන්දනයක් කරන්නට සමහරුන් තැත් කරනවා. ඇතැම් ආගම් අදහන අයට දැඩි ලෙස උවමනා වී ඇත්තේ නූතන විද්‍යාව මගින් තමන්ගේ ආගම තහවුරු වෙනවා යයි කියන්නට. මේ ගැන ඔබේ මතය? මෙය මා දකින්නේ විද්‍යාවේ හා තාක්ෂණයේ වේගවත් දියුණුව ඉදිරියේ තව දුරටත් පවත්වා ගත නොහැකි තමන්ගේ ආදිකාල්පික මත තහවුරු කිරීමට ගන්නා දුර්වල ප්‍රයත්නයක් හැටියටයි. සෑම ආගමක් ම මිනිසා විශේෂ නිර්මාණයක් ලෙස සැලකුවත් සත්‍යය නම් මිනිසා යනු සත්ව පරිණාමයේ එක් අවස්ථාවක් පමණක් වීමයි. පරිණාමීය ක්‍රියාවලියේ එක් සතෙකුට පමණක් අදාල වන ‘සත්‍යයන්‘ තියෙන්නට බැහැ. උදාහරණයක් හැටියට මිනිසාට වඩා බුද්ධිමත් යන්ත්‍රයකට මේ ආගම් අදාල වේ ද? එසේත් නැත්නම් ආගම් වලංගු වන්නේ කාබන්වලින් සැදුණු ජීවින්ට පමණක් ද? ක්ලාක් මහතා කියා තියෙනවා ආගම නියෝජනය කරන්නේ මිනිසාගේ නොමේරූ අවස්ථාවක්ය කියා. එතුමාගේ සමහර කෘතිවල මිනිස් වර්ගයා මෙම ළදරු ප්‍රවණතාවන්ගෙන් මිදෙන බවට ඉඟි කර තිබෙනවා. අද දක්නට ලැබෙන ආගමික උන්මාදය දෙස බලන විට පෘථිවියේ අනාගතය සුරක්ෂිත කළ හැක්කේ සියලු ආගම් ඉවත දැමීමේන් බව ඉතා පැහැදිලියි. එසේ නැත්නම් තමන් අදහන දෙය පමණක් සත්‍යයයි විශ්වාස කරන විවිධ කොටස් එකිනෙකා විනාශ කර දමන බවට කිසිම සැකයක් නැහැ. Arthur C Clarke’s last story: A world without religion in 2500 A.D.
අපි ඇදහිල්ල ප්‍රතික්ෂේප කර දර්ශනය පිළිගත්තොත් විසඳුමක් වේවිද? තමන්ට තමා සරණයි.. ධර්මය සරණයි. බුදු දහම ඇදහීමක් අවශ්‍ය නෑ. විඳ ප්‍රත්‍යක්ෂ කර බලන්න පුලුවන්..
සිත, කය, වචනය සංවර මිනිසෙක් බිහිකිරීමයි. ඒ කාර්යය ඔහු විසින්ම කරගත යුත්තක්. සහ සතර සතිපට්ඨානය ඇදහීමක් අවශ්‍ය නෑ. @atulasiriwardane This is brilliant. Respect! Reblogged this on Dawkins's dodo|ඩෝකින්ස්ගෙ ඩෝඩෝ. විද්‍යාව ආගමක් ලෙස ගැනීම බන්දුසීලට පිළිකෙව් කිරීමට බැරිවීම අරුමයකි! ආතර් සී. ක්ලාක් ආගම් නිර්වචනය කළේ පූජනීය ස්ථාන තිබෙන, ශුද්ධ යයි සම්මත ග‍්‍රන්ථ ඇති හා පූජකයන් හමු වන සියඵ ම ඇදහීම් ලෙසයි. තරුණ වියේ පටන් කිතු දහම නිර්දය ලෙස විවේචනය කළ ඔහු, මැදිවියේදී අනෙක් සියඵ ම ආගම් හා ඇදහීම් ගැන ද දැඩි කළකිරීමෙන් යුතුව කථා කළා. ආගම් යනු මිනිස් මනස ලෙඩ කරන මනෝ-වයිරසයක් (virus of the mind) යයි ප‍්‍රකට බි‍්‍රතාන්‍ය විද්‍යාඥ රිඩඞ් ඩෝකින්ස් (Richard Dawkins) කළ ප‍්‍රකාශය ක්ලාක් එක හෙළා පිළි ගෙන එය ප‍්‍රතිරාවය කළා. අද අප එන්නතක් ලබා ගෙන රෝගකාරක ක්ෂූද්‍ර ජීවී විශේෂයකින් නිදහස් වන්නා සේ අනාගතයේදී මානවයන්ට ආගම් ඇදහිලි නැමැති මනෝ වයිරසයෙන් නිදහස ලබන්නට හැකි බවට ක්ලාක් කියා තිබෙනවා. එම තත්ත්වයට පත්වූ විට (අද වසූරිය රෝගය ගැන අප ආවර්ජනය කරන්නා සේ) ආගම් ගැන ද හැගීම්බර නොවී, ආවේගයෙන් තොරව මැදහත්ව කථා කරන්නට මානව සංහතියට හැකි වනු ඇති. 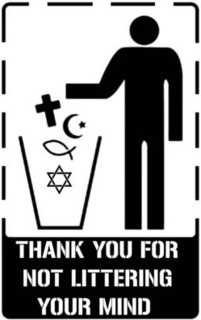 Non – Religious people are increasing in every country day by day. Because human mind is being defiled day by day..
Clarke: Though I sometimes call myself a crypto-Buddhist, Buddhism is not a religion. He doesn’t have to be right about everything. A religion by definition is a set of beliefs that are taken by a group of people on faith, which means without any evidence. There’s no evidence of rebirth (In fact, it doesn’t even make sense in a scientific point of view). So do you still fail to see Buddhism for the religion it is? Buddhism may be “innocent” in some aspects, of course (like Dawkins, I’d like to call it herbivorous, while religions like Islam are carnivorous). But every religion is like (/is actually) a living organism that has many similarities to a spreading viral infection. It still has its problems and delusions. You know Buddhism as it is reflected on people who believe in Buddha’s teaching. To judge Buddha’s teaching properly you have to practice his way of life, purifying your mind here and now. Your mind is impure just like everybody elses mind. That leads to suffering whether you are not aware of your suffering. Buddha’s teaching is meant to make your mind your mind pure here and now. Since you don’t know the core of the teaching you can have doubts. But your convictions are wrong. කයෙන් මිදී මනසෙහි කොටුවීම නිසයි. අවදි කරගෙන දෙකම ජයගත යුතුයි. මේ කිසිදු දෙයක් ඇදහීම අවශ්‍ය නෑ. අන්ධයන් වෙන්නට පන්දම වීසි කිරීමක්. ඇස් නැති හැම කෙනෙක්ම අන්ධයන්ය. It’s easier to delude yourself into thinking Buddhism is the white sheep among the lot of black sheep that are other religions. Actually, I too believe Buddhism to be somewhat innocent; but do you find it weird that all of the religion-parts of Buddhism are claims of supernatural phenomena that are accepted by its followers _without_ evidence. තමන්ම දහම විමර්ශනය කරල බලන්න. ඔහු තර්ක බුද්ධිය පාවිච්චි කරනවා. ඇස් ඇති අය ඇස් හැර බැලිය යුතුයි..
අාගමක් දහමක් යනු තමා විසින් පිළීගත හෝ නොගත යුතු දෙයකි. ඒය වැරදි හෝ නිවැරදි විය යුත්තේ ‘කුමන පොතේ තිබුණා ද කවුරැන් කිව්වා ද’ යන්න මත නොව තම දැනුම මත හා විශ්වාස කිරීෙම් හැකියාව මතයි. අාගම් ලෙසින් වෙන් නොවී සෑම අාගමකම අැති හරයාත්මක කොටස සෑම අයෙක් ම තේරැම් ගැනීමට උත්සාහ කළ යුතුයි. ඒවිට අැදහීම් වලට ගැති නොවී නිවැරදි දෙය නිවැරදි ලෙසත් වැරැද්ද වැරදි ලෙසත් තේරැම් ගැනීමට හැකි වේවි. Useful article as a starting point. However, politically ignorant. How does your/Mr. Clerk’s viewpoint explain the rise of religious forces in parallel to the development of science (and now mostly exploiting science and technology)? Otherwise, by now, the religious forces should have been faded with scientific establishment naturally. But the reality is that it has been fuelled ever vigorously! Explanations are only available with the science of politics. The deliberate rift between science and politics (and considering politics and religion in the same category) is no more funnier than considering religion as science! Religion should be used as a mirror to transparent His or herself.when it is wear as a jewelry it will create stereotyped extremism. Doctrine guild the people to inculcate good human values but the religion guide the people for the spiritual slavery.